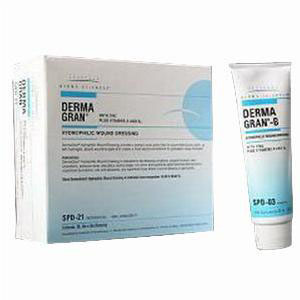 Derma Sciences dermagran hydrophilic impregnated gauze wound dressing delivers either a primary cover or filler for chronic and acute wounds. It is supplied in two forms-impregnated gauze and tube-both contain Derma Sciences' zinc-nutrient formulation and pH-balanced technology which provides a moist, mildly acidic environment conducive to wound healing. Contains vitamin A, vitamin B6, calcium and magnesium, which play an important role in tissue repair. Also helps with management of tissue trauma, surgical incisions and partial thickness thermal burns.